I am not sure about everyone else ....but as far as i can see if there are users there will be suppliers ....it does not take any sort of genius to realize there will always be suppliers ,....i never have and will never have sympathy,for users ...and unfortunately its a business ,and there will always be someone there to fill a void ..pity is wasted on the weak . SIERRA MADRE DEL SUR, Mexico (AP) — Red and purple blossoms with fat, opium-filled bulbs blanket the remote creek sides and gorges of the Filo Mayor mountains in the southern state of Guerrero. It is a business that even the farmers don't like. In a rare interview with reporters, the villagers told The Associated Press that it's too difficult to ship farm products on roads so rough and close to the sky that cars are in constant danger of tumbling off the single-lane dirt roads that zig-zag up to the fields. They say the small plastic-wrapped bricks of gummy opium paste are the only thing that will guarantee them a cash income. "Almost everyone thinks the people in these mountains are bad people, and that's not true," said Humberto Nava Reyna, the head of the Supreme Council of the Towns of the Filo Mayor, a group that promotes development projects in the mountains. "They can't stop planting poppies as long as there is demand, and the government doesn't provide any help." Villagers granted the AP access to their farms and agreed to interviews only if they were not identified, fearing it could draw attention from government drug eradicators or vengeful traffickers. Residents say there are no local users. They hate the taste of the bitter paste, which they sometimes rub into their gums to sooth an aching tooth. It all goes for export, a lucrative business mostly run by the Sinaloa Cartel. According to the DEA's 2014 National Drug Threat Assessment, Mexico produces nearly half of the heroin found in the United States, up from 39 percent in 2008. While Afganistan is by far the world's largest producer, it largely sends to markets in Europe and Asia. 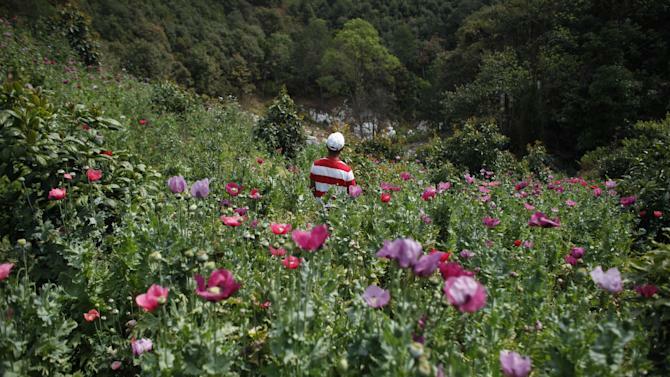 Mexican government seizures of opium and eradication of poppy plantations have skyrocketed in recent years. The trends are consistent: Opium paste seizures in Mexico were up 500 percent between 2013 and 2014; poppy field eradications were up 47 percent; and seizures of the processed drug increased 42 percent. Along the U.S. border they are three times what they were in 2009. Mexican heroin has become cheaper and more powerful at a time when Americans hooked on pharmaceutical opiates are looking for an affordable alternative. Combined with dangerous additives like fentanyl, a synthetic opiate also produced in Mexico, it is blamed for a wave of new addictions and overdoses in the U.S. Heroin deaths doubled from 2011 to 2013, while deaths from cocaine and prescription opiates remained steady, according to the Centers for Disease Control. It used to be that Mexican cartels shipped brown heroin from Colombia along with their home-grown black tar. But all producers are making the high-grade white now, and Mexican criminal gangs have learned that they can increase their profits exponentially if they manage the whole production chain, as with methamphetamines, which they also control from precursor to user. The Sinaloa cartel farms out most production of opium paste to smaller traffickers, according to growers, law enforcement and drug-trafficking experts interviewed by the AP. That kind of decentralized system is a recipe for setting Guerrero's small, feuding drug gangs, the Rojos, Pelones, Guerreros Unidos and others, against each other. Since 2012, Guerrero has been Mexico's most violent state. But only recently has it gotten world attention, when 43 college students disappeared last September and are assumed murdered by the Guerreros Unidos, who had close ties to the mayor in the town of Iguala and reportedly viewed the students as a rival gang. The growers won't say which gang buys the opium paste they produce on small plots. But a buyer affiliated with the local gang lives in almost every village, acting also as a lookout. Most can be identified by the short-wave radios they carry in a region far from telephone lines or cellular towers. When the poppy plants finish flowering about three months into the winter growing season, a farmer armed with a razor-sharp, thumb-scorer and a metal scraping pan can collect 300 grams of opium paste, worth 4,000 pesos (more than $275 USD), in a single day. The price for the relatively low-quality marijuana the farmers used to grow at lower elevations has fallen, possibly because of the legalization and medical use of higher-quality U.S. marijuana. Most law enforcement officials say it's still too early to document an impact. But the farmers see a change. They only get about 250 pesos (about $17 USD) per dried, pressed kilogram (2.2 pounds) of marijuana, compared to 13,000 pesos (nearly $900 USD) per kilo of opium paste. One wiry farmer with a joking manner and a baseball cap noted that's more than he could make in a month at any legitimate job, if there were any legitimate jobs around. But they can lose a season's work in a few minutes to the government helicopters that spray powerful herbicides on any fields they find. Towering pine and fir trees on the hillsides help shield the poppy fields from view, and some of the mountain villages that protect their forests from illegal logging do so to hide their fields. But they are detectable to the experienced eye, rare spots of green in the winter, when most other crops have been harvested. Since they use gravity-fed irrigation systems from mountain streams, they are usually near creek beds, with black plastic tubing bringing the water down to drip or spray systems at each plant. The herbicide kills both the poppies and anything around them. No one in these villages has been told what it is. And it can kill or damage local Ocote pine trees, allowing beetles to move and attack the weakened trees, and then neighboring trees, farmers said. "The money the government spends on aerial spraying would better be spent on long-term development projects," Nava Reyna said. When the buyer stocks enough opium paste from the farmers, he calls his cartel bosses to have it picked up and taken for processing at a lab. From the Guerrero mountains, most of the opium paste is shipped to wholesale collection points like Iguala, a city at the crossroads of several highways, including the interstate from Acapulco on the Pacific Coast to Mexico City. There it is packed aboard passenger buses for "shotgun" smuggling to labs sometimes as far as the U.S. border. Once the paste becomes heroin, it is moved like any other drug in cars, trailers, buses, and mules across the border to the U.S. market. There are no mega-labs for heroin, unlike those for meth. Though there are raids, they're generally small and they don't make news. Many farmers say they would like to give up poppy cultivation and plant legitimate crops, in part because of the bloodshed the trade has brought. Some growers are trying. In two of the three self-admitted opium growing villages the AP visited, residents have tried planting avocados, a crop that can bring cash income at similar altitudes in the neighboring state of Michoacan. They have also built trout ponds. But the trout are small because of a lack of food, and avocados take at least seven years before they yield a viable amount of green, shiny fruit. One farmer proudly showed off the 2- and 3-year old avocado trees he had planted on his steep hillside plot of about 20 acres. Because the trees can produce for four or five decades, he may someday have a plot his children and grandchildren can make a living from. But cultivation is expensive. So meanwhile, the farmer walked further down his plot, into a narrow creek valley, where his "flower garden" grows. He waited to score his bulbs until noon, "because the sun draws the gum out." "This," he said, pointing to the poppy bulb he has just scribed with a cutting tool to let the sap leak out, "is what finances that" he said, pointing uphill to the avocado trees.